Bravely Second End Layer has proven to be a success in Japan, and considering the highly respectable sales of its predecessor in the West it's little surprise that it's now confirmed for localisation. The Square Enix-published RPG had recently been trademarked in Europe, so this isn't particularly surprising news. Both Nintendo of America and Nintendo of Europe have confirmed that it'll make its way to the 3DS in the regions in 2016, so it's still a little while off. It's certainly pleasing news, nevertheless - is this going onto your 3DS wishlist? I think there are already more 3DS games confirmed in 2016 that I'm interested in than 2015! Particularly RPGs. Bravely Default is in my backlog. This will give me enough time to beat it before this 2nd game comes out. Nice. Wonder if I should wait for this or get the first game? So excited. I literally can't wait. Assuming Pokemon Z is released in 2015, this and FE: If are easily the games I've been most excited for 2016- and for in my entire life. @sinalefa Get the first game. It's a direct sequel so you'll want to finish BD first. I better hurry up and buy the first one. @JubilifeRival Well, since college is just about ended for me (...for now) and I'm headed for summer (HOPEFULLY without any summer classes), there shouldn't be a reason for me to never beat it...ever. Right now, I'm just nearly starting Chapter 4 (I think?) as I just got the Fire Crystal awakened and I am in the ship, beefing up the party's jobs. Edit: Sorry, I was on the train and on my way to my last day at college before summer, so I fixed things up in my comment. I keep hearing mixed reactions about the first game. Not sure if I want to track it down. But for a spinoff franchise to get localized like this generally means it did well. Something I till don't get. Was Bravely Default underrated or something? I mean, I see a lot of people saying, "I should play the first one." Even me. Now that Second is announced, people have started to take notice on Default. Also Edea was in your party in the video. It'll probably be temporary but I hope you get some or all of your old party members back permanently, bit of a plot hole why they are so depowered though to make the game fair (Bravely Default 1 practically expects you to be level 99 by the time you fight the last boss). @DarthNocturnal Inb4 obligatory first half good second half bad comment. @StephenYap3 It's worth finishing. The ending has been mind-blowing stuff that I'm almost positive will play into BS:EL. @DarthNocturnal It's not really a spin off franchise. @DarkKirby God I love the true final boss in that game. I had a great time playing Bravely Default. There is this part in the game (which does tie into the story) where things get a bit repetitive and I hear a lot of people don't finish the game from that point. I myself had the game hanging around for a long time but I finished it in the end, and loved it. 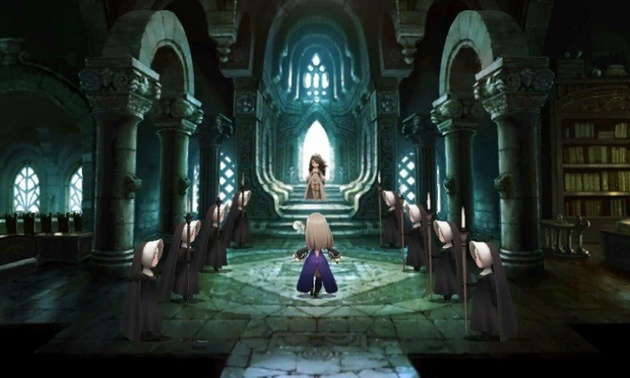 I'll be looking forward to Bravely Second, assuming they don't push their luck by expanding on microtransactions. @DarkKirby Personally, I wish that the game brought back the whole crew. @linforcer Yep, the repetitive-ness of the first game was a bit annoying, but the game was so amazing that it hardly damaged my feelings about it. @linforcer There it is lol. Hyped beyond belief the first game's repeat part actually had some deep changes and got the player know more about the characters, both allies and foes. Also for the impatient people there was the lamer ending, but the true ending is a must. Getting it but have to finish Bravely Default first. Yay, with this and Fire Emblem, 2016 looks like a good year for us already! I need to finish BD first but I'm still looking forward to this one. i might buy the first one. maybe getting the second one after i complete the first one or buy before i got the first one. I figured this would be announced at E3. Glad to see the localization is finally confirmed. Oh good, I have time to finish the first one. . .if I can ever put Splatoon down. @RatKing64 I'd rather sign a petition for DQ VIII localization on 3DS. Definitely can't wait for this one, I loved the first game. I kind of wish they'd wait longer on it, because you know there'll be a Final Mix version we now won't get.